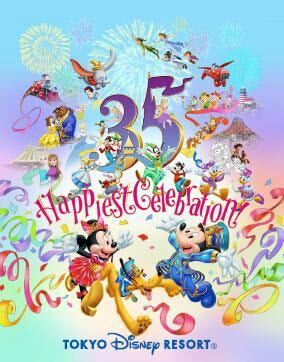 Tokyo Disney Resort announced its “Tokyo Disney Resort 35th ‘Happiest Celebration!’” entertainment and special events program. The celebration will take place from April 15, 2018 through March 25, 2019. Tokyo Disneyland Park opened its gates on April 15, 1983 and grew from a single theme park into a resort that includes Tokyo DisneySea Park, four Disney Hotels and more. This major celebration marks the 35th Anniversary of the Grand Opening of Tokyo Disneyland Park. Guests visiting both Tokyo Disneyland and Tokyo DisneySea will be able experience all the special celebrations. New Daytime Parade: Dreaming Up! Kicking off the celebration at Tokyo Disneyland Park will be the premiere of “Dreaming Up!,” a brand new daytime parade, and the reopening of the iconic attraction “it’s a small world” after being temporarily closed for extensive enhancements. In summer, “Celebrate! Tokyo Disneyland” will premiere. This new nighttime spectacular at Cinderella Castle will feature more new effects and a grander scale than ever before. A special theme song created just for the 35th Anniversary will be used in various programs.